Conveniently located near Beaune and Chalon-sur-Saône (A6 -autoroute du soleil at only 10'), the mansion has been build in 1783 by the Countess Louise Juillet de Montreuil. The domain, also known as 'Château Juillet de Montreuil' is situated on the famous wine route 'route des grands vins'. In 2015, mr. & mrs. De Brie gave the 1,5 ha property an overall facelift to balance the mordern standards and the splendour of the 18th century. The 18th century of Louis XVI, was the era of baroque, gold, brocade and marble. In the spirit of those days, with antique objects, artefacts and luxurious tissues, the interior has been completely refurnished and redecorated with a contemporary feel to it. The domain is equipped with an outdoor saltwater pool, with terraces, loungers and chairs. Enjoy the cooling water during hot summerdays or just relax and enjoy a glass of Grand Cru Champagne produced by our family domain. 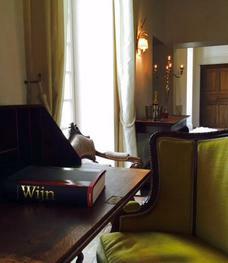 Share with us "the Burgundy way of life"... Charm, peace and gastronomy in an intimite atmosphere. Everyday we do our outmost to keep this beautiful domain in its glory. This atmosphere of discreet luxury we continue in the rooms, the parc and the services to make your stay unforgettable. "Of the 7 hotels we visited during our tour through Europe, this was definitly the best address!" ........................................€ 142/n Room "Climat" € 152/n Room "Prestige"€ 179/n Jr Suite "1er Cru" € 202/n Jr Suite "Grand Cru"€ 250/n Family Suite "Loft"